No Escape is very much a family affair as Jack leads his wife Annie (Lake Bell) and his two kids (both of whom are annoying enough to inspire audiences to root for the rebels) on the lam from a mob of angry rebels who have overthrown the government and are killing tourists in protest of Western invasion. Jack, there for the controversial dam project, realizes that he and his family are targets. The film plays like The Impossible meets Hotel Rwanda meets Taken as the family finds themselves trapped in a hotel under siege by machete-wielding rebels, who flood the city like a tsunami and bring comparable damage. Disaster and death loom everywhere, and the film is an adrenaline-pumping survival mission to save the family. Filmmaker brothers John Eric Dowdle and Drew Dowdle essentially envision No Escape as a breathless action sequence as the Dwyers evade the rebels and flee in search of safety. The film hits the ground running just minutes after it begins and the action never lets up. It’s very intense as the family encounters obstacle after obstacle and sees fellow tourists cut down, gunned down, butchered, and terrorized at every turn. By zeroing in on one family’s plight, the film builds a solid relationship with its central characters and the institution they embody. No Escape thrusts both Jack and Annie into situations that no parent would ever want to encounter and the film asks how far any one viewer would go to protect his or her family. The film leaves the viewers with uncomfortable scenes of violence as the Dwyers fight back and their kids witness horrible acts, which, unfortunately, seem essential to their survival. The family receives some help from a scruffy Brit named Hammond (Pierce Brosnan) who assumes the role of a gun-totin’ tour guide and (mostly) leads the family to safety. Brosnan gives a fun and scrappy performance, and when Hammond randomly disappears for a good portion of the movie, No Escape feels his disappearance, but the energy kicks in when he returns. Wilson, on the other hand, carries virtually every frame of the film and he’s quite compelling in his first dramatic role since Behind Enemy Lines. Like Wilson, Bell plays against type, and the two comic actors play well together and find the right pace and timing to go with the flow of the action without making it unbearably bleak and intense. 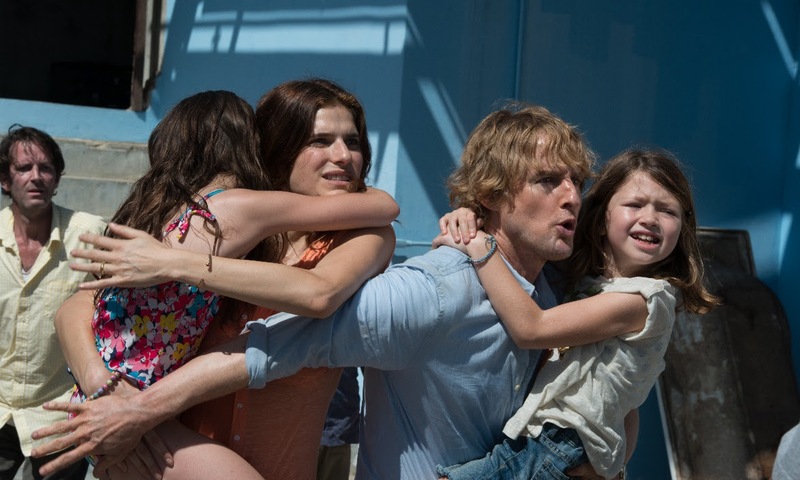 No Escape offers an engaging family-in-peril scenario, but the non-stop action gradually strains in the absence of a solid context. The film develops the impetus for the coup only slightly. It states that the dam bears some of the blame, but there’s a larger, more satisfying story that only received a few hints. However, one can appreciate that the ostensible de-politicization of the conflict helps avoid controversy and negative impressions of any one nation. No Escape delivers as a jolt-a-minute action thriller, though, as it provides break-neck, pulse-pounding action for 103 minutes. It’s very intense and consistently nerve-wracking to watch the parents and their kids evade death. Slick production values, especially the dynamic cinematography by Léo Hinstin and the kinetic editing by Elliot Greenberg, help make No Escape wild entertainment—just don’t watch it as an in-flight movie. A/V: The picture quality for this Blu-ray a step above recent VVS Films releases with a clear 16x9 1080p HD transfer that makes a film look just as good at home as it would in a theatre. Audio in the 5.1 Dolby True HD is crisp and well layered, and just right as a home viewing alternative to a slideshow of vacation pictures. Bonus Features: Extra goodies are sparse but serviceable. The film features commentaries that are hidden away in the setup menu, in addition to fifteen minutes of behind the scenes footage. The latter option includes interviews with the Dowdle brothers and Wilson, Bell, and Brosnan. The filmmakers’ discussion of their choice to focus on the plight of the family helps mellow any awkwardness or frustration over the lack of political resonance within the coup. They frame the film as a family drama above all, and the actors’ discussions about their characters similarly illuminations the family’s quest for survival. The Blu-ray also features two deleted scenes that offer Brosnan ample screentime. One scene, which includes a slightly-too-comedic burst of violence as Hammond gets the family out of a sticky situation, seems reasonably omitted from the final cut. The second scene, however, feels like an odd plot-point to remove, for the bonus features show an early scene in which Hammond warns Jack about something troublesome a-brewing on the streets. The scene perhaps reveals too much about Brosnan’s character, but it’s an effective bit of foreshadowing that hints at larger forces behind the coup. No Escape is now available on Blu-ray, DVD, and digital from VVS Films.